Groundhog or woodchuck is the common name for a North American burrowing marmot, Marmota monax, of the rodent family Sciuridae, characterized by large size, a heavy-set body, short-legs, grizzled brownish fur, and an asocial nature uncharacteristic of marmots. Other common names regionally include whistlepig and forest marmot. Groundhogs provide a number of values. Ecologically, they are part of terrestrial food chains, eating wild grasses and other vegetation, as well as some small invertebrates, while their reproductive rate allows them to provide food for such predators as wolves, coyotes, bobcats, hawks, and even snakes (in the case of young groundhogs). For humans, they serve as model organisms for medical research, including on the hepatitis B virus, which is similar to a related virus in groundhogs. In North America, they also provide a unique cultural role as the focus of Groundhog Day, celebrated for a folk tradition of a prophecy of Spring. 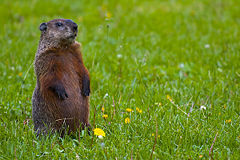 The groundhog belongs to the group of rodents known as marmots. The marmots comprise the genus Marmota and are characteristically stocky, short-legged and diurnal, and commonly short-furred and burrowing. They are part of the rodent family Sciuridae, or squirrels, a family that includes ground squirrels, tree squirrels, and flying squirrels. The marmots, and thus the groundhog, are part of the ground squirrels, and are generally large ground squirrels. The ground squirrel taxon also including groups such as the chipmunks and prairie dogs. Sciurids, or squirrels, like all rodents, are noted for their teeth. They have a pair of large incisors on the upper and one on the lower jaw that grow continuously and need to be kept short and sharpened by frequent gnawing. Most marmots, such as yellow-bellied and hoary marmots, live in rocky and mountainous areas, but the groundhog or woodchuck is a lowland creature. It is widely distributed in North America and common in the northeastern and central United States. In the west it is found only in Alaska, Alberta, British Columbia, northern Idaho and Washington. It extends down to Georgia, Alabama, Arkansas, and northwestern Louisiana in the east (Karels 2004). 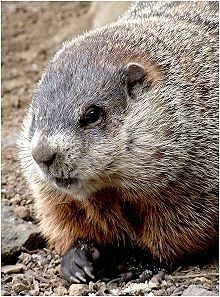 The groundhog is the largest sciurid in its geographical range, typically measuring 40 to 65 centimeters (17 to 26 inches) long (including a 15 centimeter tail) and weighing two to four kilograms (4.5 to nine pounds). In areas with fewer natural predators and large quantities of alfalfa, groundhogs can grow to 80 centimeters (32 inches) and 14 kilograms (30 pounds). Groundhogs are well adapted for digging, with short but powerful limbs and curved, thick claws. Unlike other sciurids, the groundhog's spine is curved, more like that of a mole, and the tail is comparably shorter as well—only about one-fourth of body length. Suited to their temperate habitat, groundhogs are covered with two coats of fur: a dense gray undercoat and a longer coat of banded guard hairs that gives the groundhog its distinctive "frosted" appearance. Like other sciurids, groundhogs have exceptionally dense cerebral bones, allowing them to survive direct blows to the head that would cripple other mammals of the same body mass. A nearly-motionless individual, alert to danger, will whistle when alarmed to warn other groundhogs. While most marmots are highly social, including those that live in family groups of up to 35 members, the groundhog (Marmota monax) is asocial (except during breeding and raising of the pups) (Karels 2004). Indeed it is the only asocial marmot and is assigned the Latin name monax, for "solitary" (Karels 2004). Among individuals of their own species, groundhogs are generally territorial and agonistic (aggressive or defensive social interaction between individuals usually of the same species), and may skirmish to establish dominance (Whittaker and Hamilton 1998). Groundhogs are excellent burrowers, using burrows for sleeping, rearing young, and hibernating. The average groundhog has been estimated to move approximately one cubic meter (35 cubic feet), or 320 kilograms (700 pounds), of dirt when digging a burrow. Groundhog burrows usually have two to five entrances, providing groundhogs their primary means of escape from predators. Burrows are particularly large, with up to 45 feet of tunnels buried up to five feet underground, and can pose a serious threat to agricultural and residential development by damaging farm machinery and even undermining building foundations. Though groundhogs are the most solitary of the marmots, the same borrow may house several individuals, such as in the case of raising pups (Light 2001). 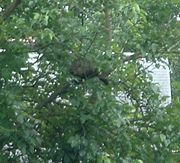 Groundhogs are able to climb trees, and can be seen resting in the branches. Outside their burrow, individuals are alert when not actively feeding. It is common to see one or more nearly—motionless individuals standing erect on their hind feet watching for danger. When alarmed, they use a high-pitched whistle to warn the rest of the colony (CWS 2008). Despite their heavy-bodied appearance, groundhogs are accomplished swimmers and climbers, and climb trees to escape predators or survey their surroundings (Chapman and Feldhamer 1982). They prefer to retreat to their burrows when threatened; if the burrow is invaded, the groundhog tenaciously defends itself with its two large incisors and front claws. The groundhog prefers open country and the edges of woodland, and it is rarely far from a burrow entrance. Since the clearing of forests provided it with much more suitable habitat, the groundhog population is probably higher now than it was before the arrival of European settlers in North America. Groundhogs are often hunted for sport, which tends to control their numbers. However, their ability to reproduce quickly has tended to mitigate the depopulating effects of sport hunting. As a consequence, the groundhog is a familiar animal to many people in the United States and Canada. Groundhogs feed on a variety of plants such as grass, clover, and berries. Mostly herbivorous, groundhogs primarily eat wild grasses and other vegetation, and berries and agricultural crops when available (Whitaker and Hamilton 1998). Alfalfa, clover, and dandelions are preferred (Karels 2004). Twigs, bark, and leaves have also been foraged (Karels 2004). Groundhogs also eat grubs, grasshoppers, insects, snails, and other small animals, as well as bird's eggs, but are not as omnivorous as many other sciurids. Common predators for groundhogs include wolves, coyotes, bobcats, bears, large hawks, and owls. Young groundhogs are often at risk for predation by snakes, which easily enter the burrow. Usually groundhogs breed in their second year, but a small proportion may breed in their first. Pregnancy rates for yearling females is ten to twenty-five percent, while it is fifty-six to eighty percent for older females (Karels 2004). The breeding season extends from early March to mid- or late April, shortly after hibernation. A mated pair remains in the same den throughout the 28-32 day gestation period. As birth of the young approaches in April or May, the male leaves the den. One litter is produced annually, usually containing two to six blind, hairless, and helpless young. Young groundhogs are weaned and ready to seek their own dens at five to six weeks of age. Groundhogs are one of the few species that enter into true hibernation, and often build a separate "winter burrow" for this purpose. This burrow is usually in a wooded or brushy area and is dug below the frost line and remains at a stable temperature well above freezing during the winter months. In most areas, groundhogs hibernate from October to March or April, but in more temperate areas, they may hibernate as little as three months (RIDEM).To survive the winter, they are at their maximum weight shortly before entering hibernation. They emerge from hibernation with some remaining body fat to live on until the warmer spring weather produces abundant plant materials for food. The hibernacula of females are aggressively defended by dominant males (Karels 2004). Before their first hibernation, about ninety percent of juvenile males disperse, while about sixty-five percent of juvenile females disperse; the rest remain within their natal home and disperse the following year (Karels 2004). Groundhogs are often seen by the side of the road. Although usually shy, groundhogs may forage near human structures. In addition to their ecological roles as part of terrestrial food chains, groundhogs also provide a number of values to humans. Humans can eat groundhog, but it is recommended that the scent glands be removed before cooking. They also are model organisms for medical research in endocrinology, reproduction, neurology, and metabolism, including extensive research on the hepatitis B virus, similar to a related virus in groundhogs known as woodchuck hepatitis virus (Karels 2004). The groundhog also has a unique cultural role in North America, celebrated on February 2 for its spring prophecy. In the United States and Canada, this annual "Groundhog Day" celebration has given the groundhog some added recognition and popularity. The etymology of the name woodchuck is unrelated to wood or chucking. It stems from an Algonquian name for the animal (possibly Narragansett), wuchak. The apparent relationship between the two words has led to the common tongue twister: "How much wood would a woodchuck chuck if a woodchuck could chuck wood? and the response line "A woodchuck would chuck as much wood as he could if a woodchuck could chuck wood." Other common response lines are "As much wood as a woodchuck would if a woodchuck could chuck wood" (Silberg 2003) and "A woodchuck would chuck as much wood as a woodchuck could chuck, if a woodchuck could chuck wood" (Rountree Smith 1923). Groundhogs raised in captivity can be socialized relatively easily; however, their aggressive nature can pose problems. Doug Schwartz, a zookeeper and groundhog trainer at the Staten Island Zoo, has been quoted as saying "They’re known for their aggression, so you’re starting from a hard place. [Their] natural impulse is to kill ’em all and let God sort ’em out. You have to work to produce the sweet and cuddly" (Newman 2007). Canadian Wildlife Service (CWS). 2008. Mammals: Woodchuck Hinterland Who's Who. Retrieved May 31, 2008. Chapman, J. A., and G. A. Feldhamer. 1982. Wild Mammals of North America: Biology, Management, Economics. Baltimore: Johns Hopkins University Press. Light, J. 2001. Marmota mona Animal Diversity Web. Retrieved May 31, 2008. Newman, A. 2007. Grooming a weatherman for his TV debut, and hoping he doesn't bite the host New York Times, January 12 2007. Retrieved May 31, 2008. Rhode Island Department of Environmental Management (RIDEM). n.d. Woodchucks in Rhode Island Rhode Island Department of Environmental Management. Retrieved May 31, 2008. Rodent Specialist Group. 1996. Marmota monax 2006 IUCN Red List of Threatened Species. IUCN 2006. Retrieved May 12, 2006. Rountree Smith, L. 1923. Two Hundred Games that Teach. Chicago: Beckley-Cardy. Silberg, J. 2003. The Learning Power of Laughter. Beltsville, MD: Gryphon House. ISBN 087659268X. Whitaker, J. O., and W. J. Hamilton. 1998. Mammals of the Eastern United States. Cornell University Press. ISBN 0801434750. This page was last modified on 19 September 2014, at 16:58.